Turkey’s capital of Istanbul is full of incredible architecture, history, and food, but if there’s one attraction that really stood out to me on my visit to this city then it would have to be the Hagia Sophia. This massive 1,500 year old Byzantine cathedral-turned-mosque is an absolute must see if you’re ever traveling in this part of the world. Located in the old district of Istanbul, the cathedral is easy to visit from any part of the city. The Hagia Sophia definitely belongs on any traveler’s bucket list! Construction of the Hagia Sophia cathedral dates back to 537 AD, when Istanbul (known then as Constantinople) was the capital of the medieval Byzantine Empire. Hagia Sophia was an engineering marvel at the time, and for awhile it was the largest building in the world. It remained the largest cathedral in the world for almost 1,000 years. In 1453, the city of Constantinople fell to the Ottoman Empire and the Hagia Sophia was turned into a mosque (which is when the four Islamic minarets were also added). Most of the building was preserved, and in 1935 the mosque was transformed into a secular museum by Atatürk, the founder of the Republic of Turkey. Today, the Hagia Sophia museum is recognized as a UNESCO World Heritage Site and it attracts over 3 million visitors per year. I took this photo of the Hagia Sophia from a hotel rooftop near Sultanahmet Square. Before going inside the Hagia Sophia, it’s a good idea to walk around the building on the outside and get a better look at the huge dome, buttresses, and minarets. The scale of these is enormous, and one of the best viewpoints for taking photos is at the fountain in the middle of Sultanahmet Square. On the Hagia Sophia grounds, you can also visit the tombs of the Sultans, a group of 3 smaller domed buildings with intricate Islamic motifs and writing. Before going inside, it’s a good idea to walk around the outside and get an up close look. It’s an incredible feeling when you first step inside this massive building and walk through the same halls as Emperors and Sultans from centuries past. The atmosphere is pretty breathtaking and you feel a bit like a time traveler, surrounded by ancient history. After exploring the halls on the first floor, be sure to walk up the stairs to the second floor, where you can see bright golden mosaics of Biblical scenes and figures, still mostly intact from medieval times. From here you can also get a better view of the intricate domed ceilings. The glittering gold mosaics are still impressive today. This is what the huge domed ceilings look like from the inside. Entry to the Hagia Sophia is pretty straightforward, and there are guides you can hire at the entrance if you’d like to have things explained for you as you go (although this is optional). The line for tickets is mostly hassle free and goes pretty quick, then you’ll be on your way. The last allowed entry time is 1 hour before closing. Children 8 years or younger can visit free. On the second floor you can get a better look at some of the intricate ceilings. The inside of the main dome looks even more amazing from the second floor. The Hagia Sophia is located in Sultanahmet Square, the old historic quarter of Istanbul. From Sabiha Gökçen International Airport (SAW), which many international flights into Istanbul seem to use, the distance to the Hagia Sophia is about 30 miles (45 km). You can get to the Hagia Sophia with a taxi or Uber, but it’s much cheaper (and almost as quick) to just take the HAVABÜS shuttle bus from the airport to Taksim Square and then grab an Uber for the remaining short distance trip from Taksim to Sultanahmet. While you’re visiting the Hagia Sophia, it’s highly recommended to go see the nearby Blue Mosque and Topkapi Palace as well! These can be reached on a short 5 minute walk from the Sophia. There are some hotels in Istanbul that have great rooftop views of the Hagia Sophia. 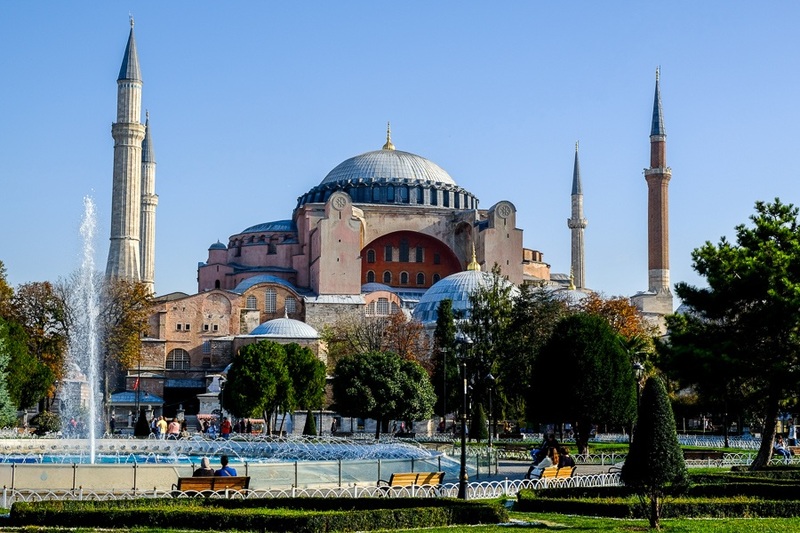 When Is The Best Time To Visit The Hagia Sophia? Istanbul has a Mediterranean climate, with hot summers and mild, rainy winters. The Hagia Sophia is not heated or air conditioned on the inside, so it can be a bit uncomfortable in the middle of the summer or winter. The best months to visit would probably be in the spring or fall when the temperatures are cool. With that said, Istanbul does not have extreme temperatures in any season, so most months would be fine for a visit. One thing you’ll want to monitor is any ongoing construction. The Hagia Sophia is frequently being repaired and preserved, and this could mean scaffolding in your photos. As of this posting, there is a little bit of scaffolding on the inside but nothing significant on the outside. It’s a great time to visit!